Countrywide Sheds offer a wide variety of Sheds, Storage Solutions, Summerhouses, Playhouses, Bespoke Buildings, Garden Offices, Workshops, Garages, Log Cabins and more. We make Garden Buildings to suit your requirements, whether it is a Home Office, a Workshop or a Summerhouse we can provide you with a bespoke service to cater for your needs. All buildings are made by experienced craftsmen using the best quality materials for practical good looks and excellent durability. Countrywide sheds offers much more than a traditional garden shed, as our range of timber outbuildings are available in a wide range of sizes and styles. As all of our sheds are built to order, we can offer a flexible and cost effective way to make your garden look even more special. Our garden buildings are available as wooden sheds with an apex or pent roof, with single or double doors and a huge range of window options. Our playhouses create a wonderful environment for children of all ages, see some examples on our playhouse page. Bespoke summerhouses add a unique feature to any garden and provide that bit of extra space to relax and unwind. See examples of our work in the summerhouses section. All of our garden buildings are manufactured in our Bedfordshire workshop by skilled and experienced craftsmen. We only use the best materials and build garden sheds to withstand our British winters. 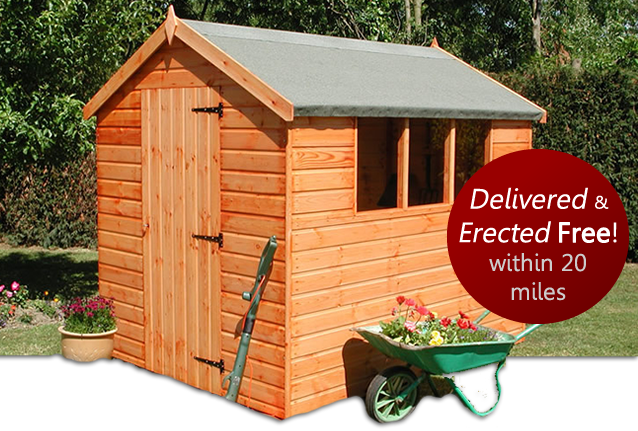 Our timber sheds can be built to any budget and the free delivery and erection save you hassle and money. We manufacture a full range of standard sectional buildings and can also custom build to special requirements. All of our sheds are assembled by experienced craftsmen using the best quality materials for practical good looks and excellent durability. Full timber treatment to floor and exterior walls. All glass is supplied cut to size ready to fit. Delivered and erected free of charge within 20 mile radius. A firm level base must be provided. If you are within a 20 mile radius of our workshop in Maulden Bedfordshire, then we offer a free delivery and assembly service. If you are outside of the areas then a small surcharge may apply. We deliver and erect garden buildings and sheds in Luton, Bedford, Ampthill, Flitwick, Henlow, Biggleswade, Hitchin, Arlesey, Letchworth, Dunstable, Leighton Buzzard, Milton Keynes and other areas in Bedfordshire, Hertfordshire and Buckinghamshire. Thank you for your helpful and professional support. I will have no hesitation in recommending your company. Mr T Hamilton, Bedfordshire. I found your lads very friendly and thought they took time to explain to me what they were doing as I do like to know what's going on. They really are an attribute to your company. Simon Hope, Bedford. Many thanks from us for a first class job. F Stitt, Ampthill. Need a Loft conversion company in Bedfordshire? Countrywide sheds launch their new website.